Sta-Stuk is specifically designed to effectively bond sound barrier mats and recycled rubber sound insulation to a variety of surfaces. 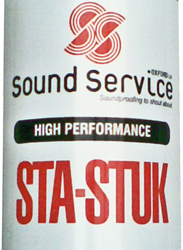 Sta-Stuk is designed to bond a variety of our acoustic products to a wide range of surfaces when a permanent fixing is required. It is particularly effective for bonding our M20AD sound insulation for walls. Please click on the link top left.